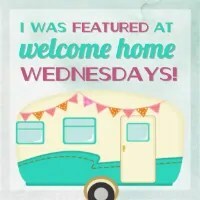 Welcome to Welcome Home Wednesdays #50!!! I absolutely adore looking through your projects every single week and this week is no exception! We’ve made it to week 50!! Yeah! We’ve been hanging out with you all and sharing and loving all the goodies shared here!! Thank you ALL for coming back week after week!! We sincerely APPRECIATE it! Like any good hosts we’re sitting right by the present table waiting until our guests leave so we can go through the loot… the loot being your Welcome Home Wednesdays #50 links! We can’t wait to check out what you’ve left for us. Trust me there will be a lot of pinning, tweeting and facebook sharing going on in the near future… we can’t wait to show off what you’ve left! I brought a pitcher of tea to share for my link hopping. I am leaving behind an breakfast, a brunch and a baking tip! Have a great day and enjoy the sunshine! Love tea, Marilyn! Thanks for dropping by with your yummy recipes!! Good Morning Erin, Thank you for the feature! Have a great day. Thanks for stopping by and having such great posts, Kathy! Thank you ladies for hosting with great features and so many great linkups. Now Im off to check out a few! thanks for linking up, Karren! We appreciate you being here! Thank you for stopping by, Lizette! Glad you could join us! Thank you for hosting! Congratulations on week 50! Thanks, Dianne! Can’t believe we’re at week 50! It’s amazing. Thanks also for linking up. You’re awesome! Thanks so much for featuring our Cat Condo! Thanks for linking up with us and sharing your creativity! Have a wonderful week! Thanks so much for featuring our Blueberry Kiwi Lemonade! Of course! Great recipe! Thanks for linking up with us!